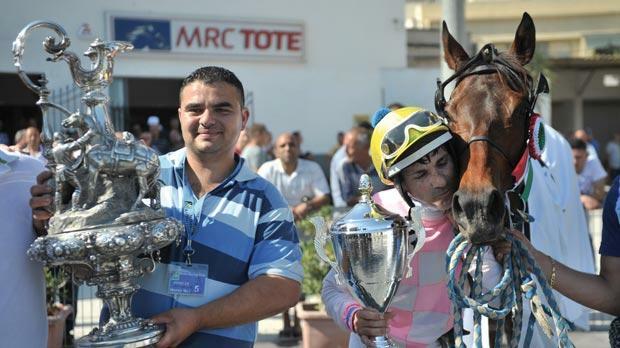 Irish four-year-old mare Gold As Good, ridden by Sicilian jockey Giovanni Formica, won the 2014 Mediterranean Derby at the Marsa racetrack yesterday. This prestigious final formed part of the 29th meeting of the season which was made up of nine races, including one from the class Premier. Eight horses were at the start of the Mediterranean Derby final. It was Gold As Good the first horse out of the gates opening a half length lead from Pearl Storm (Charles Vella), 2013 winner Kimberley Downs (Michael Sultana) and Timolin (Demis Zammit). Gold As Good never relinquished its lead during the 1,750m distance and in the final straight also managed to sustain the late challenge of Kimberley Downs to grab victory. Timolin and Pearl Storm finished in third and fourth place respectively. At the end of this final, Dr Matthew Brincat, MRC chairman, presented the prestigious trophy to Jonathan Abela and Formica, the owner and jockey respectively of the winning mare. In the class Premier race, held on the short 2,140m distance, Danish mare Made In Hoff, driven by Charles Camilleri, surged ahead as the horses turned for the final straight. Made In Hoff went on to notch its first win of the season and its second in Malta by more than a length from Mont Cenis Honey (Noel Baldacchino) and Opal Hall (Tony Mallia). Chiara Sisu (Melvin Farrugia) had to settle for fourth place. Made In Hoff clocked an average time of 1.15” per kilometre. Quiet Way (Salvu Vella) ran out of steam and started to slow down around 300m from the end of the class Gold race. In the final straight, this French trotter was overtaken by Original Blue (Chris Cassar) which took its first win of the year by a length and a half from Count Of Life (Claudio Refalo). P.A. Surprise (Lorraine Cunningham) ended fourth. Yesterday’s card included also three races for class Silver which were all won by French trotters - Rayon De Soleil (Mark Mifsud), Ravenovillais (Noel Baldacchino), and by Quersis which was also driven by Baldacchino. Another meeting at the Marsa Racetrack will be held on Sunday. The first race is scheduled for 1.45pm.